HEADING – Begin with a heading that includes your name and contact information, including email address, phone number, and physical address. 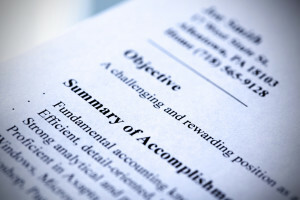 OBJECTIVE – Objectives are increasingly becoming optional, but can be included if your objective is specific to the company to which you are applying. QUALIFICATIONS – Although you will list specific responsibilities in the Work History section, it is important to highlight the qualifications that specifically qualify you for the position for which you are applying. WORK HISTORY – In this section list all relevant prior and current employment, including company name, location, your job titles, and the dates you were employed. EDUCATION – Include a list of diplomas and degrees obtained. Recent college graduates should also list relevant coursework. SKILLS – In this section list specific skills such as software, hardware, and language. For more information about the resume outline, click here. To see examples of a completed resume, click here to visit our general resume template page and download your free resume template.